It’s the final pay-per-view event of 2018 for WWE and the one night of the year when tables, ladders, and chairs are all part of the action! 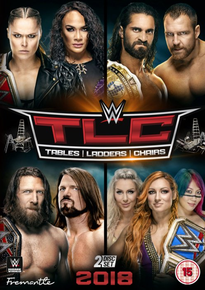 Headlined by a huge triple-threat TLC match for the SmackDown Women’s Champion featuring Becky Lynch, Charlotte Flair, and Asuka, plus action from Daniel Bryan, AJ Styles, Seth Rollins, Dean Ambrose, Ronda Rousey, and more! TLC is always one of the most exciting nights in the WWE calendar and the 2018 edition was no exception! There’s bone crunching action as tables, ladders, and chairs are thrown into the mix, and with major championships on the line the stakes are as high as ever! Becky Lynch, Charlotte Flair, and Asuka take the women’s division to new levels of brutality in their jaw-dropping TLC match. But there’s a shocking ending that could have huge implications for WWE heading into WrestleMania season! Elsewhere, Daniel Bryan and AJ Styles put on a technical masterclass, while the heated Seth Rollins vs Dean Ambrose feud cranks up another notch. And there’s even more impressive table-smashing, chair-swinging, and just plain nerve-rattling action from Superstars including Rey Mysterio, Randy Orton, Finn Bálor, Drew McIntyre, The New Day, The Bar, and lots more!